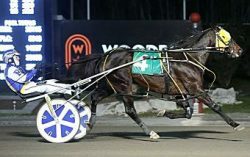 Milton, ON — The legendary Foiled Again delivered a final memorable moment for Canadian racing fans with an impressive victory in the penultimate start of his career Saturday (Dec. 22) at Woodbine Mohawk Park. Foiled Again was a 1:53.2 winner on Saturday. New Image Media photo. The richest Standardbred of all-time came first-up from third at three-quarters to challenge leader Alexa’s Jackpot and stormed by in the lane to win by 2-1/4 lengths in 1:53.2 for driver Louis Philippe Roy and trainer Ron Burke. A large crowd turned out despite freezing temperatures to take a photo with Foiled Again during a pre-race meet and greet session. Fans rushed out to the apron and made plenty of noise cheering Foiled Again home and in the winner’s circle. A winner of $7.6 million, Foiled Again now has 109 victories over the course of 13 seasons on the racetrack. The 14-year-old gelding has added more than $70,000 to his career earnings in his final season for owners Burke Racing Stable, Weaver Bruscemi and JJK Stables. Mohawk Park holds a special place in the career of Foiled Again. The richest win of his illustrious career came in the $794,870 Canadian Pacing Derby on Sept. 1, 2012. Foiled Again was making his last start on Canadian soil and the penultimate start of his career on Saturday at Woodbine Mohawk Park. The Burke trainee will make his final start on New Year’s Eve at The Meadows in Pennsylvania before retirement. A $2 win ticket on Foiled Again returned $3.70.